Click on the question to show answer. Who will normally arrange or require a UK Hole in One insurance policy? Typically a Hole in One insurance policy will be purchased by the event organiser, which will normally be for an official golf competition, a corporate or charity golf day. Who is covered under a UK Hole in One policy? Any participating amateur player in the competition provided that they are aged 18 or over, officially entered and abide by the rules of golf and the competition. Who provides the prizes in the event of a hole in one? 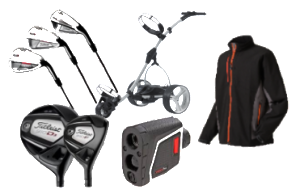 In the event a lucky participating player achieving a hole in one, then we will arrange the claims process.In respect of the main prize hole, we can arrange payment directly to the player or a supplier, such as a car dealer as appropriate.In respect of ancillary prizes, we will arrange for these to be shipped directly to the winner at a UK address. What are the prizes on the ancillary holes? Can I change the prizes on ancillary holes? No, the ancillary hole prizes are determined by ourselves and cannot be changed. They are, of course, optional as you can buy a policy just covering the major prize hole. Will I lose my amateur status if I win a Hole in One competition? The rules of golf were amended in 2012 allowing amateur golfers to win a substantial prize in a Hole in One competition without losing their amateur status, providing that it is during a round of golf and incidental to that round. Prior to this the maximum amount an amateur golfer could win was capped at £500. What happens if someone gets a hole in one, can the next person still win it? Yes, our polices include automatic reinstatement of the prize, if a hole in one is achieved. What is the minimum number of participants allowable? The minimum number of participating players is 30 amateurs. Can professional golfers participate in a Hole in One competition? Under our policy professional golfers are not eligible to participate in the Hole in One competition. If you require this cover for a pro-am competition then amateur golfers can enter and you should advise professional golfers that they are excluded from the Hole in One competition. Do I get a discount if I buy online? Yes, you will receive a 5% discount when you purchase your policy on line. Is signage available for the prize holes? Yes, we provide downloadable A4 signs which you can print as required and explain the prize along with the event name. Optional water resistant covers and securing pegs can also be purchased. What value of major prize can I insure? You can insure a major prize of between £4,000 and £50,000. What major prizes can I insure? You can select from prize money, a car or any other prize subject to it not being illegal and approved by us. Can you cover competitions abroad? No, our policy is only available in the United Kingdom including the Channel Islands and Northern Ireland. What is the shortest major prize hole you can insure? 150 yards for men and 135 yards for ladies. What is the shortest yardage for an ancillary prize hole? Minimum 75 yards for men and ladies. What are the criteria for a witness? A person or persons named by you, aged 21 or over who is not a participating player and are responsible for witnessing all attempts at a hole in one on the main prize hole. We only require one witness providing that the main prize value is no greater than £35,000 and that the witness has a clear and uninterrupted view of both the teeing area and the cup of the hole on the target green. In the event that a single person is unable to have a clear and uninterrupted view of both the teeing area and the cup of the hole, or the main prize is greater than £35,000, then we will require 2 nominated witnesses, one of whom is positioned at the teeing area and the other of whom is positioned adjacent to the main prize hole. Are witnesses required on ancillary prize holes? No, witnesses are only required on the main prize hole. Can I use this insurance to part pay for a prize? No, the major prize value cannot exceed the amount of cover purchased. Our policy is underwritten by Aviva Insurance Limited.